I have found that the best leaders with whom I serve find a way to make themselves simultaneously valued and dispensable. A dichotomy indeed. The people and things we value most are not what we think of as easily replaceable or superfluous, the definition of dispensable. It is logical to say that the exact opposite is true – we value the indispensable leaders. That is, until they are gone. As leaders of a team we have two primary responsibilities beyond mission accomplishment: strengthening the team and developing other leaders. Our value is largely measured by the ability of the team to cooperatively execute today’s mission while preparing leaders to seize the opportunities of tomorrow. Our dispensability is largely measured by the amount of our direct involvement required in both the preparation for and execution of action. When I consider the two metrics, I am reminded that when we join a team, our value is in our presence, our coaching, and our behavior shaping. At the same time, the more present we are, the more coaching we do, and the more behavior shaping required of us, the more indispensable we make ourselves. That is to say that the very path to becoming a valued leader may very well make the team increasingly dependent upon us. That is not the objective. As a leader, one of the best ways to signal trust and confidence in a teammate is through the delegation of authority. 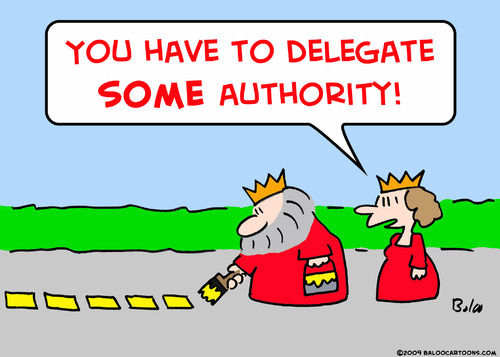 There are authorities that are inherent in certain positions within a team and there are authorities that accompany specific ranks or levels of seniority, but it is in those instances when a leader chooses to add to (or subtract from) those built in authorities that true delegation occurs. Provided there is unity of effort across a team, the best teams have a low center of gravity. They are empowered to make decisions at low levels within the organization and enjoy critical thinking, creative problem solving, and collective ownership at all levels. The challenge is ensuring that unity of effort is maintained as that center of gravity is lowered. Earlier this week I met with a senior military leader. He commented that one of his predecessors did a wonderful job of building a team, shaping behavior, and delegating authority. The team of leaders developed by this predecessor earned the delegated authority as a result of their demonstrated unity of effort and shared understanding of operational priorities. As time went on and that unified team of leaders transferred (along with their leader), their reliefs enjoyed the same delegated authority without benefitting from the coaching and behavior shaping they did. The leader who delegated that authority was valuable to the team he led and made himself dispensable through responsible delegation. Unfortunately, by keeping the delegated authorities in place and allowing behaviors to change, his relief had no choice but to make himself indispensable. With atrophied unity of effort, a central orchestrator was now required to ensure enterprise solutions were realized. Unless, of course, the orchestrator pulled that authority back. It’s important for us as leaders to remember that we are simultaneously managing an organization, while leading the individuals currently assigned to it – two different, but related responsibilities. We strengthen the team of today and we develop the leaders within for tomorrow. Years after we depart, the organization may look nothing like it did when we left it and that is expected – we are dispensable. But, provided we did our part to be of value, the individuals we helped shape and the relationships we built during our tenure will endure. As leaders, we must strive to make ourselves dispensable over time (e.g., ensure others grow into our role in our absence). As human beings, we ought to make ourselves indispensable (e.g., connect with, invest in, and truly care about teammates). Our value is measured daily. Today, it’s about mission accomplishment. Tomorrow, it’s about the team you built and the relationships that endure. For every day that follows, it’s measured by the success enjoyed by the teammates we helped prepare for their opportunity to shine. What are you doing to ensure you are (in)dispensable? What unintended consequences have you yet to consider? Have you found the optimal balance between delegated authority and unity of effort? I think the more senior we get, the easier it is to tighten the reins, pull the center of graviting closer to the top to ensure mission accomplishment first hand. This proximity to everyday operations and planning may guarantee mission accomplishment exactly when and how the senior wants it. But, as you articulate, it can come at a cost to developing future leaders’ skills that come with certain degree of autonomy, like creativity, confidence, resourcefulness, etc. The best leaders find the right balance between orchestrating close enough to the core of the mission while coaching the team with respect, encouragement and guidance to ensure juniors grow their ability to lead in future.